It’s so sunny here today. 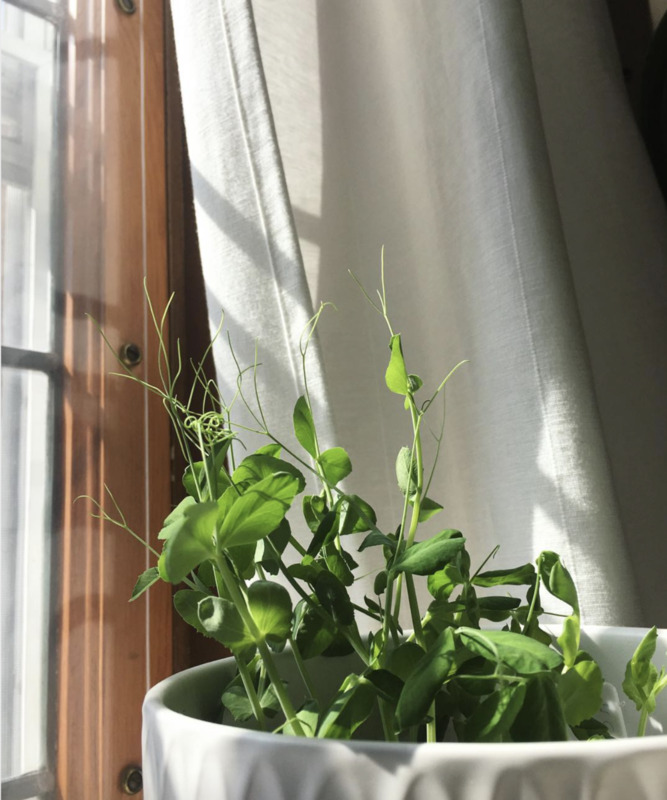 Bright green tendrils of the pea plants we seeded are trying to climb the cord for the blinds, and I remembered to tie a scarf around the doorbell chimes so the bliss of naptime won't be interrupted by a box of diapers being delivered. I feel so much lighter this month. So much calmer and better able to roll with the punches. March was rough here. Maybe it is for everyone, with the gloomy, grey-brown of winter that seems to drag on and on. But this year my car was totaled in a rear ending, and our baby got RSV and pneumonia, which made for scary trips to the ER, purchasing a nebulizer, and generally a lot of stress. It was a long ten days til he turned the corner, and recovering from the mental/physical toll of that time took another couple weeks. These are times I feel God reminding me to trust Him. Watching my listless baby in the car as the streetlights fly past, his burning little hands and bluish lips— I realize am NOT in control. And I know me, I need those reality checks. As much as I wish them away. I don’t know if my better mood is more because of the weather or the smily guy who is now talking to himself on the baby monitor, or because of the extra time I’ve had with God during lent. Between lenten devotions, digging out all my dog-eared lenten piano music, lent church services and reading some new lent/Easter books we intentionally bought for Isabel this year, I’ve had more Jesus in my mind and in my heart. On my lips and in my eyes as the world comes awake in spring. Easter on the flowering ground and in the greening trees. Yet it’s the same risen Lord whether I’m up or down, depleted or renewed. Because He lives, I live. On the hard days and the best days, I see Jesus. Because He lives our joy is real, and even those dark days have meaning. They draw me to a Savior who gives us perspective. And isn’t that perspective huge? For me it helps remembering these children are His, a trust from Him to shepherd for just a little while. He holds our times in His hands and because He rose, we rise each day of grace to do our best for Him. Some days my best looks better than others. Some days it’s showered, some days not. :) Some days I snap at my husband, make excuses and idols, and forget to pray. The days I am the worst, when I’m most disappointed in myself, I’m most grateful for my Savior. He did what we cannot and gave his perfect life in exchange for mine. He rose to restore a broken relationship with God, He conquered sin and death. For if we have been united with him in a death like his we will certainly also be united with him in a resurrection like His. For we know that our old self was crucified with him so that the body ruled by sin might be done away with, that we should no longer be slaves to sin— for one who has died has been set free from sin. [….] The death he died, he died to sin once and for all; but the life he lives, he lives to God. Someday we will rise to life eternal, through faith, but for now God wills we keep on keepin’ on. Rising each morning to glorify Him here. As nature itself gets decked out for Easter, I’m catching up on sleep (yes, its glorious!) and renewing a commitment to live the new life I was raised with Christ to enjoy. I came across this prayer while researching some spring preschool activities to do at home. Maybe it was included because preschoolers have a way of eliciting extra prayers from their parents... Whatever the reason it was too good not to share. Attributed to St. Patrick in 433, perhaps you’ve seen it before. I’ve seen snippets of it in greeting cards or on a canvas at a friend's house, a morning prayer for God to guide you, and that Christ may be in all things we do. Not a bad way to start off, hmm? I printed a copy of this excerpt and taped it by the coffee pot. You know that’s where things usually start at my house. :) Happy Easter! He is Risen!